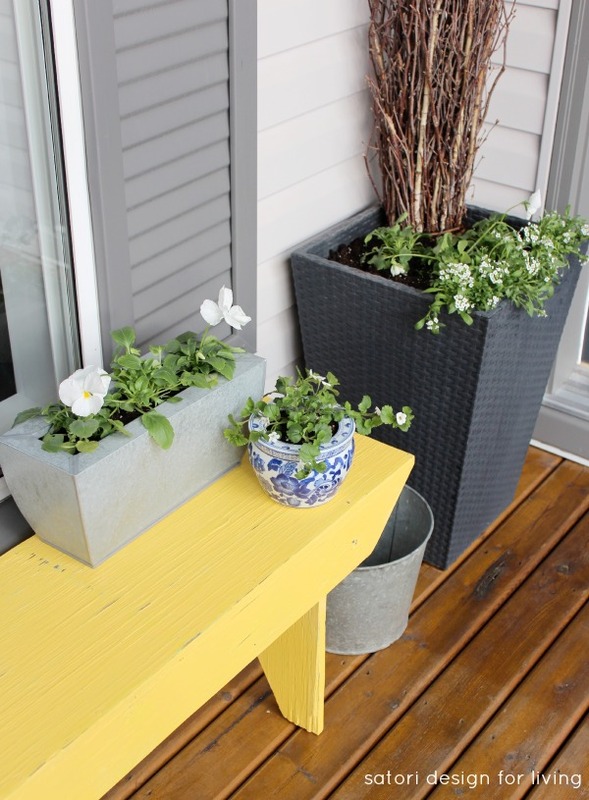 Decorated your front porch for spring yet? See how I added a bit of rustic cottage charm using vintage finds along with some new decor pieces to welcome the new season! Until last week, I wasn’t sure if I was ever going to pull out my flip flops again. Winter had been hanging on ever so tightly, and the opportunity to do any outdoor spring decorating hadn’t presented itself. By this time last year, we had our patio furniture out of storage and I had picked up quite a few plants from our local garden centres. To say we’re a bit behind this year is an understatement! Fortunately, on Thursday, I was able to put together our spring front porch. Thank you to Balsam Hill for collaborating on today’s spring front porch post in the spirit of Mother’s Day. As always, opinions are 100% my own. 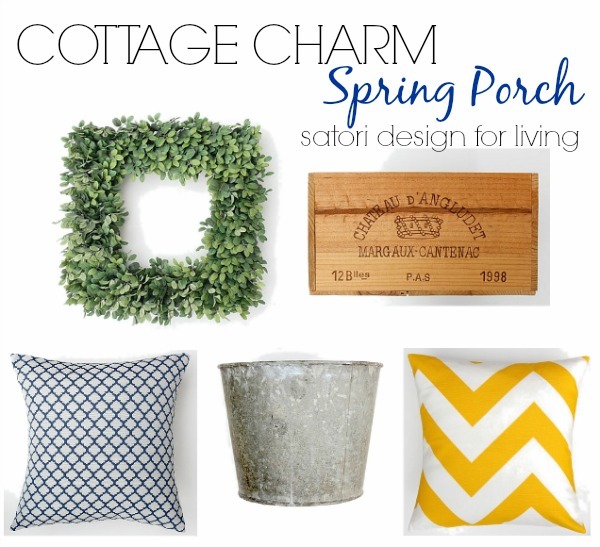 To kick off this front porch refresh, I gave everything a good spring cleaning. It’s crazy how dirty everything gets over the winter, isn’t it? Two summers ago, while visiting my parents at their farm, my mom and I discovered this rustic bench in an old shed. I knew with some TLC it would be the perfect piece to add some color and character to our neutral front porch. I love decor items with a bit of history, and the fact that this piece came from my childhood farm is an added bonus. Thanks mom! I wanted to build on the decorating scheme I put together last May and, about a month ago, began curating a collection of decor items (old and new) to create a charming cottage vibe. When Balsam Hill offered one of their gorgeous wreaths along with some cash to purchase a few spring decor items on Etsy, the entire look started coming together. Although our house is fairly new, I always like adding a touch of vintage or salvage to every space. It’s an appreciation for items with a bit of history that I share with my mom. Growing up, I remember her taking forgotten pieces from her childhood farm, such as an old milk can or antique stove, and giving them new life. I wanted to find a couple of items to repurpose as planters, and this wine crate and metal bucket really spoke to me. I paired them with the grey and white planters I used last year. Growing up in the country meant nature was a big part of our lives. I always looked forward to spring when I could help my mom plant the garden and watch it unfold over the summer. I also helped both of my grandmothers with their gardens, and to this day peonies are my favorite flower for the nostalgia they evoke. Nothing beats a big vase of these fragrant flowers on the kitchen table! Similar to last year, I decided to go with simple green and white plants. Because it’s early in the season, I chose hardy pansies (isn’t that an oxymoron! ), rosemary, alyssum, bacopa and chrysanthemums. I plan on covering them or bringing them in at night until the weather is more stable just to be safe. Once the garden centers get more stock, I’m hoping to find a white hydrangea plant to put in the maple bucket. If not, I like the way it looks empty, too. 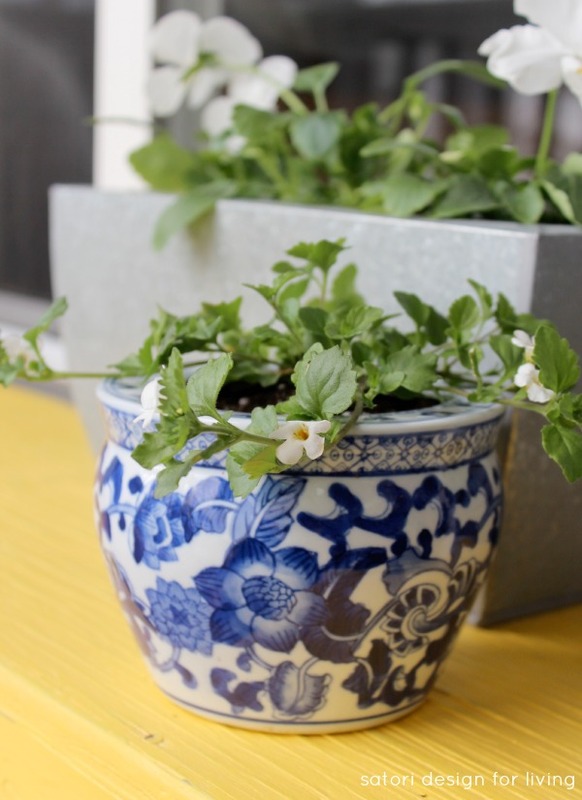 For a bit more color and charm, I picked up another tin planter and two blue pots. I found the blue and white chinoiserie one at a thrift shop for only $2! Remember, decorating doesn’t have to be expensive. I often shop secondhand for home decor. To soften the bench, I added two colorful pillows. Our house faces south, and this is my favorite spot to enjoy a glass of iced tea and get a bit of sun in the afternoon throughout the summer. Unlike my mom, I don’t have a gorgeous sunroom, but this is the next best thing! 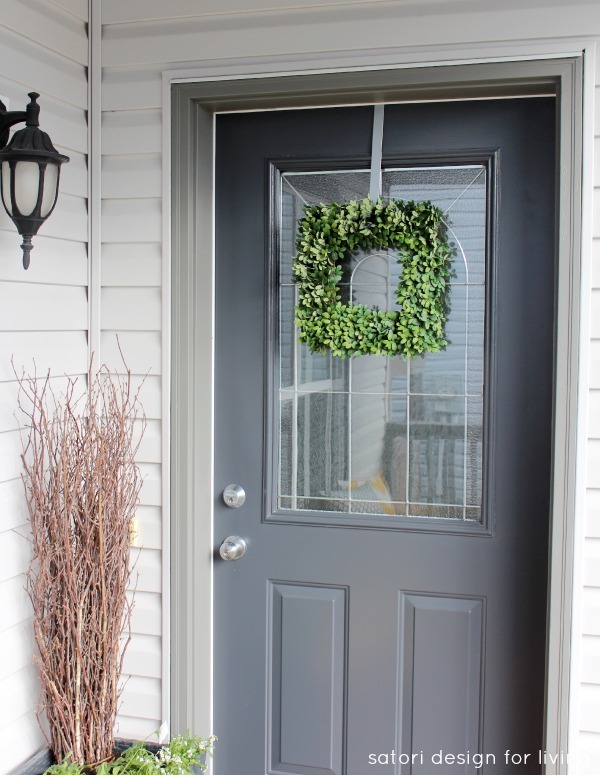 To freshen up the front door, I hung the square boxwood wreath I got from Balsam Hill. I like that it looks like cut boxwood, but will stand up to the heat of summer and the clanging and banging of the door being opened and closed so many times a day. Being a mom means selecting family-friendly, yet stylish decor. I’m thinking about adding some ribbon to dress it up a bit, but it is a great stand-alone piece. 1) Start with a foundational furniture piece with bit of character. 2) Select decor items (old and new) with some color and varying texture. 3) Think about how you can repurpose a vintage or salvage piece. 4) Add a touch of nature (live and/or faux). Unfortunately, it started snowing again on Friday, so I had to put most of it back inside. I guess for now I’ll have to enjoy the photos (sigh…). 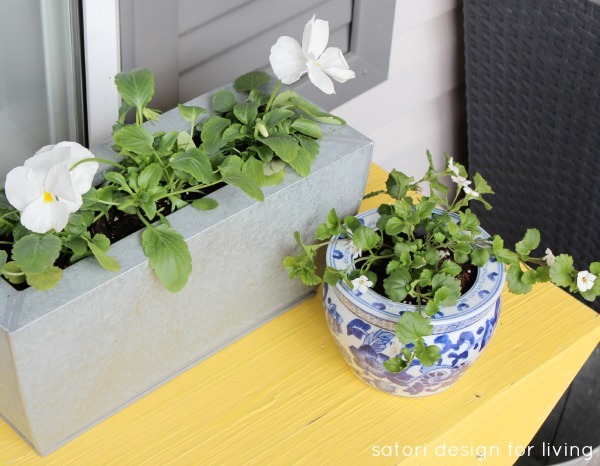 To see more ideas like this, visit the Gardening & Outdoor Project Gallery. To celebrate Mother’s Day, Balsam Hill wants to help you create a warm and welcoming space for spring. One winner will receive a Boxwood Wreath and a $100 Etsy Gift Card to use towards purchasing home decor items. You can read more about how my mom and grandmothers influenced my design aesthetic, as well as what it means to be a mom on the Balsam Hill Blog. Wow that yellow is so gorgeous against the grey! and that wreath is perfect!! 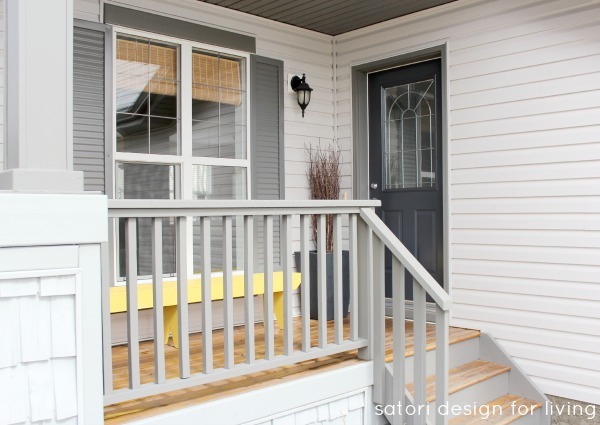 Your porch looks so fresh… perfect for Spring! Peonies are one of my favourites as well… they are just starting to peek through the ground here and I can hardly wait! The products you chose from Balsam Hill are perfect!! 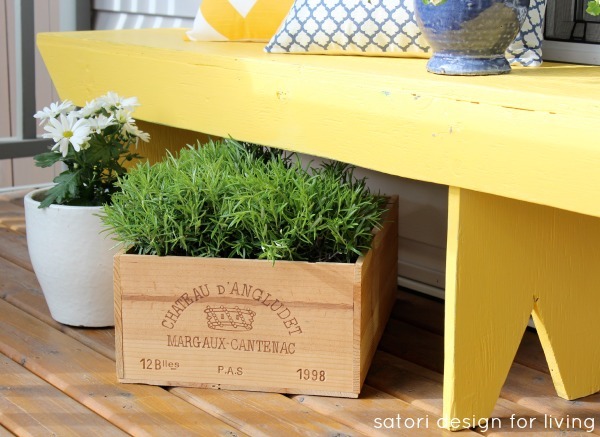 first off I LOVE the yellow paint – what a refreshing pop of color! I love being a Mom because it’s THE most coolest thing I’ve ever done. Love your porch Shauna, very pretty and welcoming! I love that wreath! Your porch is gorgeous and that yellow is perfect. So summery. Inspired to pull out my summer stuff now. I love that my mom is always there for me. Being a new mom, I hope to always give that to my daughter as well. I love that my mom is so generous and supportive. I love that it has changed me so much! I always say my girls made me who I am. I love patient and understanding my mom is. She’s such a great listener. Your porch looks beautiful Shauna! I have been looking everywhere for a square boxwood wreath, so I could hardly believe my eyes when I saw this one over here! Love it all!! What a cheerful space you’ve created. Love the burst of yellow. I love being a mom. I love everything about it. But I think I especially like seeing my son grow into the amazing person that he is becoming and watching him do activities that he loves and enjoys. Him smiling is me smiling. I love being a mom because I love seeing my little boy grown and change right before my eyes. They grow up so fast. I love being a Mom because I am my sons Hero and the undying love is an amazing feeling. I love that my mom was always so unselfish and putting us kids first. Being a mom is totally exhausting, but totally worth it! I love the colors you used for your porch! I love everything about my mom, including the fact that she has been a role model for me in terms of qualities that I should have. This porch is beautiful! I love how the yellow and blues brighten up the entire house. I love Etsy, and that wreath is so pretty! It brings a lot of colour up higher where there are no plants. I also adore the bench. 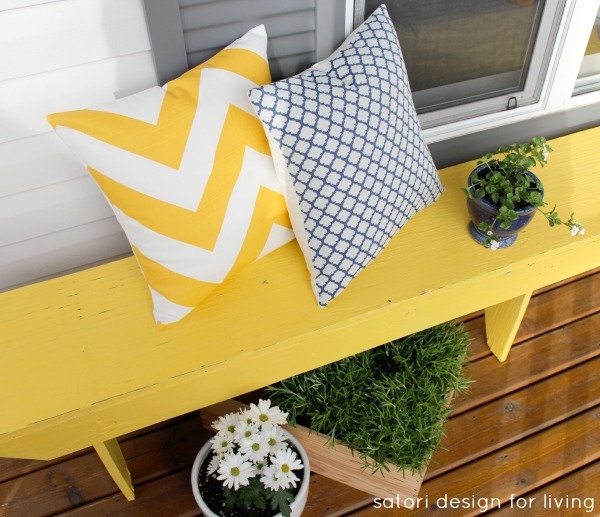 I love yellow, and it really brightens up the whole porch. I just love watching my boys grow, and seeing how all five of them are very different, with their own likes and interests and personalities. I love that my mom has always taught me everything she knows about being creative! My mom always had my back. I love the yellow! It looks wonderful! Fingers crossed spring finds your neck of the woods soon. I love that my mom gives the best advice. What I love most about being a mom — tough one. I love it all; well, almost. The most rewarding thing is watching my two girls grow up to be intelligent, kind, talented, creative and beautiful young women. Definitely my best “DIY” ever! I love that everyday is different, and that being a mom forces me to give up control. :) I love that my mom laughs at me when my daughter is as stubborn as I used to be for her. Best part of being a mom is the smiles and hugs! I’ve been working on our porches, too. The pollen here is out of control. Our front porch is covered, so it never gets fully washed away. I think I washed off a layer about 2 inches thick over the weekend. I’m waiting for pollen season to be over to finish decorating the porch for spring/summer, so if I win, the prize should arrive just in time for my decorating! I love being a mom, and teaching, sharing what I know, with them. I love the cuddles and my favourite thing to do with them was reading them books. I love being a mom and spend time with my grown up children. Best thing about being a mom is seeing things through my girls’ eyes and being reminded how awesome little things are. What an inviting porch to welcome your guests! Best thing is my boys making me laugh daily. Intentionally and unintentionally. Love the decorating ideas and the bench, the pop of color is perfect! I love family dinners every night around the table. It’s how I was raised and we continue the tradition today! My mom has been my rock, my friend, my mentor, my teacher….she is always there for me whenevr I need her. I can only hope to be a mother like her one day. I love my mom! I love how my mom is always just a phone call away :) always there when I need her!! I love that my mom is so fearless! She travels all over the world and I don’t need to worry (too much) because I know she can handle just about anything that would normally intimidate me, like the London Underground or driving with streets signs in another language or figuring out a bus schedule in Greece. My mom is amazing! Best thing about my mom is how she makes where ever she is feel like home. My mother is wonderful. She’s patient and wise. I love a lot about being a mom, but the morning cuddles are my favourite. 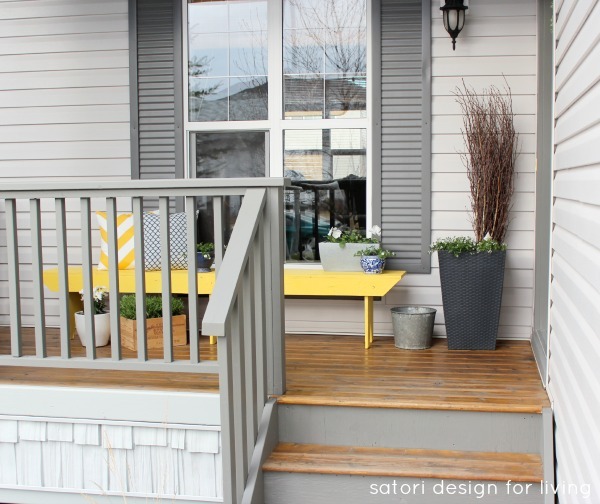 This post has totally inspired me to do our front porch sooner rather than later! SO beautiful! The yellow is so cheerful! I love watching my kids’ personalities develop and shine through! I love being a mom because I get to help my child learn about the beauty of the world. I love having someone who is ALWAYS happy to see me when I walk in that door at home. Oh, and cuddles from my girl. That’s what being a MOM is all about! Love it! Love big family dinners, homecooked by my mom! I love being a mom for the simple things like my girls huge smiles when they are happy and having lots of fun. Precious every time. The years I have with my children are the most precious and I would not trade one day with them for anything. She gives such unconditional love. I am really, really inspired by your cheerful cottagy porch. You’ve done a really great job, and my fingers are crossed the snow will give up so you can put everything out again! My Mom always encourages me! My mom is honest with me . . . even with hard truths! She brags to people about my writing and photography skills. My Mom loves to bake for me and talking to me on the phone. I love having someone to hug and kiss every day!! I love your colour scheme Shauna, so fresh and pretty for the spring…but I’m so sorry for your snow :( I hope all your plants survive. My pansies have survived quite a few frosty nights here so far! my mom is always there for me when I need her! Mom’s are the best, unconditional love. Great makeover!! She is positive and brings out the best in others. Watching them grow and become wonderful adults! I love seeing the world through my toddler’s eyes. Beautiful! And what a deal on the blue and white pot! 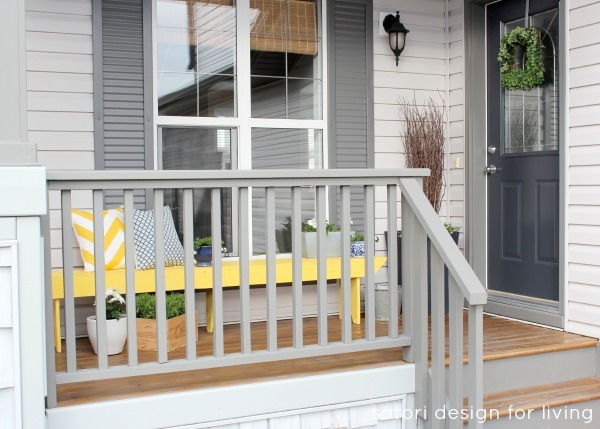 This front porch look is so awesome, I’m kind of jealous I don’t have a front porch! I’d love to have you link this up with me and the Create & Share DIY and Recipe Party. I hope to see you there! Love my Mom’s ability to make everything better, even as I am an adult when I have a bad day it makes me feel better to talk to her about it. She always knows what to say! I love that my mom unplugged the TV to make me spend my summers learning to create! It shaped my life in so many ways! Your front porch looks so nice, welcoming, clean, comfy. Know what you mean about the weather. I’ve had a cute little Spring vignette on our front porch on a big round patio table, had to bring things in a few times as the wind, rain and cold were visiting again. Mother’s Day is only supposed to be 55 here (western CO) and 50% chance of rain. bahumbug, cold at night again. I don’t dare take the quilts too far out of range. Enjoy your lovely porch when you can and Happy Mother’s day. 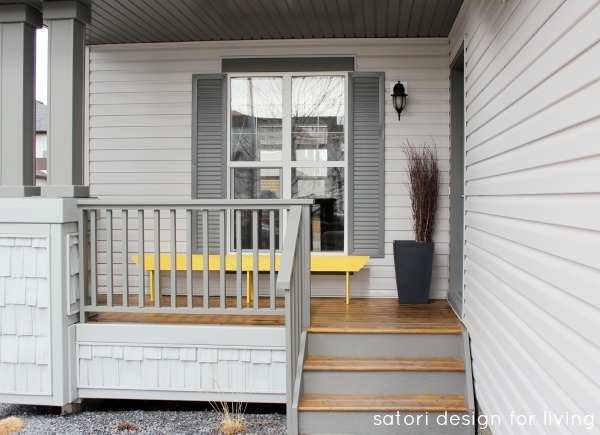 Your yellow bench is so pretty against the gray siding and shutters. 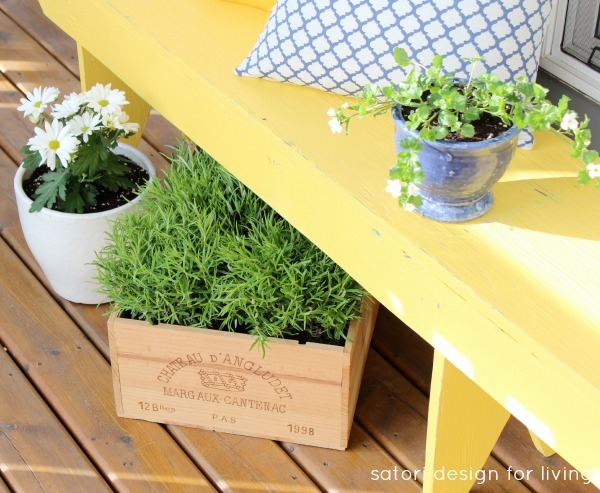 Your porch looks incredible – I love that yellow bench and the fresh and bright throw pillows are stunning- with all the pretty little plants. The wreath is a stunner!! Makes me want to get out there and get working on our front porch this weekend, we have been out weeding and mulching the gardens but I haven’t gotten to the porch yet. Still have my Easter wreath up (shhhh, don’t tell:)…. That bench really cheers the front of your house up! I love the smiles on my kids faces, even when they wake me up early..on the weekend! I love it when my kids do/say something nice for/to each other. i love my moms creativity- which she passed on to me! I love that even though Im all grown up, when I call my mom and Im sick shes always so reassuring. I feel better just by hearing her voice. I absolutely love seeing my daughters face light up when she sees me or her daddy. She is the best thing to happen to us! I love that I get to spend the entire summer with my kids, just as my mom did with me. Sharing her love and knowledge of flower gardening with me. I love everything about being a mom, I could do without the whines, but other wise my monsters are so fun. My own mother is such a strong person, I lean on her for just about everything! I absolutly love being a Mama, and now a grandma ( Gigi)! I think it is the most important job in the world and also the hardest, but the most rewarding. I think I have passed on my Mom’s strength and courage to my kids and her never give up attitude. I love my sweet memories of my Mom. She was a fantastic cook and our kitchen always smelled wonderful! She loved fresh flowers and always tried to have some in the house. I love that my mom is so encouraging. She’s my own personal cheer leader! I love being a mom, there is no better feeling!!!! i love seeing my kids smile and them making me smile. I love to watch my kids show kindness to others, makes me cry! I love how I can always count on my mom – she’s always there to lend a hand or just listen. I love that no matter what I can always rely on my Mom for anything! What I love about being a mom is watching my children grow into wonderful adults through the years. I love being a mom because I love teaching my kids new things and showing them the world. Love the porch! 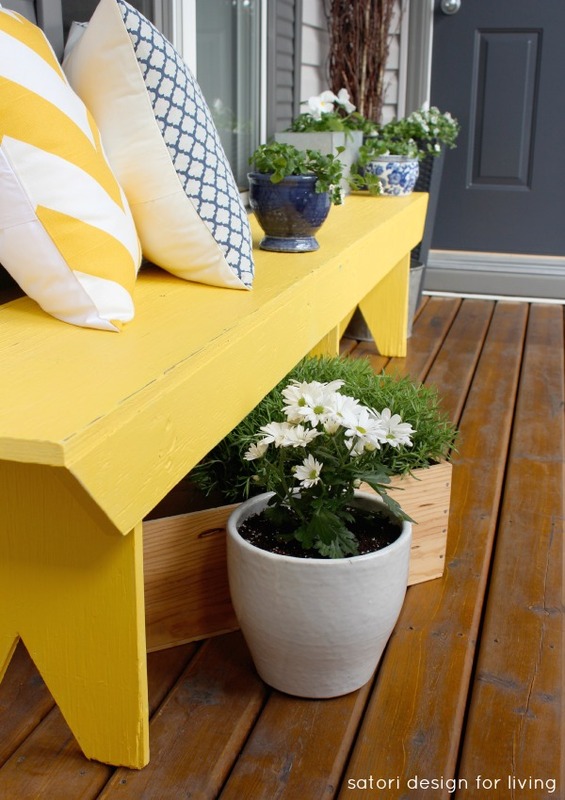 What color of yellow and brand did you use to paint the bench! Hi Lisa, I mixed Behr’s Macaw and Golden Honey (a Benjamin Moore colour custom mixed in Behr exterior paint). Sorry, but I don’t recall the ratio.